The NaI network is located in the same experimental hall as the Cube detector; it consists of ﬁve NaI crystal scintillators in the sealed aluminum (1-mm-thick) housing. The NaI crystal is surrounded by 0.5 cm of magnesium by all sides (because the crystal is hygroscopic) with a transparent window directed to the photo-cathode of the photomultiplier tube PM-49. The large cathode of PM-49 (15-cm diameter) provides good light collection. The spectral sensitivity range of PM-49 is 300–850 nm, which covers the spectrum of NaI(Tl) emission light. The sensitive area of each NaI crystal is ~0.032 m2; the total area of the ﬁve crystals is ~0.16 m^2; the efﬁciency to detect gamma rays is ~80%. For the channels of 3–4 MeV, NaI crystals underestimate the intensity due to lower efﬁciency of gamma ray detection near the electronic threshold. For the highest energies (above 60 MeV), gamma rays may not deposit their whole energy in the crystal. More information about the NaI Detector network can be found in Avakyan et al. (2013). 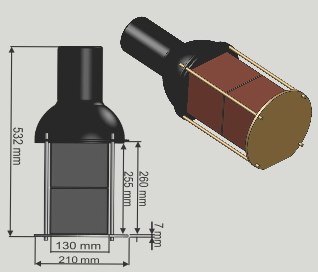 Figure 1: NaI scintillator detector.